Mr. Gibbs relayed how his vision of helping to restore high standard commercial carrier service to Iraq actually began as a passion for easing the burden on the military pilots of cargo planes and helicopters. “They have an immense task,” said Gibbs, “and what we offer helps ease that burden by flying numerous civilians working and operating in and out of Iraq.” While a few carriers from the Gulf region are now also offering commercial flights to Iraqi airports, Gryphon Airlines is the only commercial carrier that has met the standard to fly US military personnel and defense contractors into the country. The venture began in February, 2007 after a group of investors agreed with Mr. Gibbs’ vision and helped launch the airline. Beginning with turbo-prop planes into a couple of locations, the airline now provides charter, scheduled civilian, or military service that includes such locations as Baghdad, Mosul, Basra, Balad, Kabul and Kandahar. Gryphon now offers DC-9 jet service into several places that for the last several years have been inaccessible. The Iraqi government also uses Gryphon to fly its diplomats and government personnel to connecting flights in Kuwait and the airline prides itself in making coordinated emergency medical flights for seriously ill or injured Iraqi children. Gryphon is also working very closely with Iraq Airlines to assist them in improving their own commercial service. I found my own experience on Gryphon Airlines to be a welcome change to the route that one might have to take to enter Iraq if not serving in the military. The airline went out of its way to assist us with the sometimes difficult paperwork required to enter Iraq. The plane was staffed by a friendly South African crew. Unlike the ninety minute flights in the states, this flight actually provided a meal. We were able to board directly from the Kuwait International Airport. When we landed in Baghdad, we saw an Iraqi ambulance bringing two children who were burn victims being flown out of the country for special treatment. It made me feel good to see so much cooperation with the wonderful Iraqi people since I was here last leading an Infantry battalion into combat against Saddam’s regime. It was also a much different way to enter Iraq. While certainly not identical to flying in the United States or Europe due to security measures, Gryphon is a breakthrough for high standard air travel when doing business in or working in Iraq. It is just one more visible reminder of the improvements that continually are being made with the situation in Iraq. Steve Russell was recently elected to the Oklahoma State Senate. 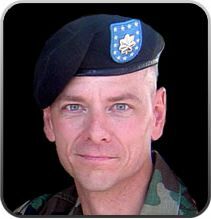 He is a US Army retired Lieutenant Colonel who commanded an infantry battalion in Iraq that was a central player in the hunt and capture of Saddam Hussein.